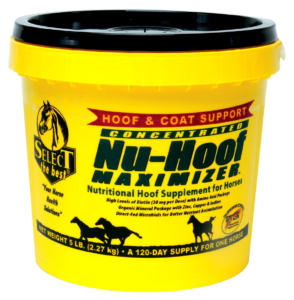 Nu- Hoof Maximizer is a scientifically formulated equine supplement with Biotin at 30mg, Folic Acid, Riboflavin, Lysine, Methionine, Copper, Iodine, and Zinc. Nu-Hoof Maximizer is based on research that demonstrated the beneficial effects of Biotin based supplement on hoof condition by reducing the incidence and severity of horn defects, increasing tensile strength, and improving the condition of the white line. The study also emphasized the benefits of supplementation for over 90 days to improve hoof growth. Nu-Hoof Maximizer is best fed when a concentrated supplement is desired.